I recently saw in a Brighton cafe a young woman dressed up in what I had thought was a fancy dress costume. Because I know the cafe well and the man who served the girl dressed in a pin striped suit, a brylcreamed male hairstyle and some strange make-up, I asked whether she was part of a fancy dress event during the day. "Sort of", he replied. "It's cosplay." "Basically," he explained, "you dress up in a persona, whatever persona you want, whenever you want. You can do it as much as you want and kind of slip into it for a day or for a period of time and then come out of it and go back to how you normally are." "How very Brighton," I thought. The youth, eh? It's not like how it was in my day. In my day, it was called fancy dress. It was unusual. There was a young woman, in a cafe, sitting down in what I would call "fancy dress" but is now known as "cosplay" with her girlfriends sipping a cappucino, while her friends were dressed in a way which I - in my unreconstructed bigotry - would call 'normal' and her friends were not joking about the outfit nor was it part of a 'fun time to be had by all', but it was a situation of total acceptance as if nothing unusual was going on at all. In other words, it seems to be a trend for people to develop altar egos and alternative personalities that they slip into whenever they want and for this strange situation to be welcomed - a situation that I would find a little confusing in my 'traditional' mindset - a mindset that has developed over years having removed myself, with God's grace, from a more 'bohemian' existence to one that is decidedly more straight-laced. In fact, despite the inner struggle for 'my ego's constant demand for a really exciting existence' that once haunted me, I crave more and more simplicity in life. It really goes back to the desire for the authentic - the real - that I have blogged about recently. We keep hearing of how the Church must respond to "new realities". Fr Ray Blake has recently blogged on the subject of a papacy that promotes reality or wants to deal with 'realities' perhaps to the detriment of 'ideas' but some 'ideas' are 'ideas' for a while before they become 'realities'. Pope Francis himself has suggested that for the Church to 'help people' the Church must be in touch with 'reality'. Thinking of the way in which society promotes "new realities" - or "alternative realities" to the point that good, old-fashioned "REALITY" which we would once have called "NORMALITY". The Church, says Francis, needs "healthy contact" with reality, what people are "going through", "not to indulge them" said the Pope, but to "communicate with them". The problem is we rarely hear of any dialogue or communication that suggests that there really is a 'normal' or that there really is a 'abnormal' or, dare I say it, 'disordered' way of life. The anti-objective Truth movement that has resulted in society's creation of and embracing of "new realities" is no great surprise, nor the vehemence with which the Church's Truth is rejected in favour of those subjective 'realities' that people either create or have been created for them only for them to adopt. The obvious 'reality' is the LGBTQ (add letter here) movement for whom gender and identity is an ever-increasing area of personal discovery in the subjective sphere with a new label just waiting to be added to the list of 'new realities'. However, the 'cosplay' woman I saw in the cafe just goes to show these 'new realities' don't have to be even pinned down to 'trans-anything' or even a fixed personal identity. 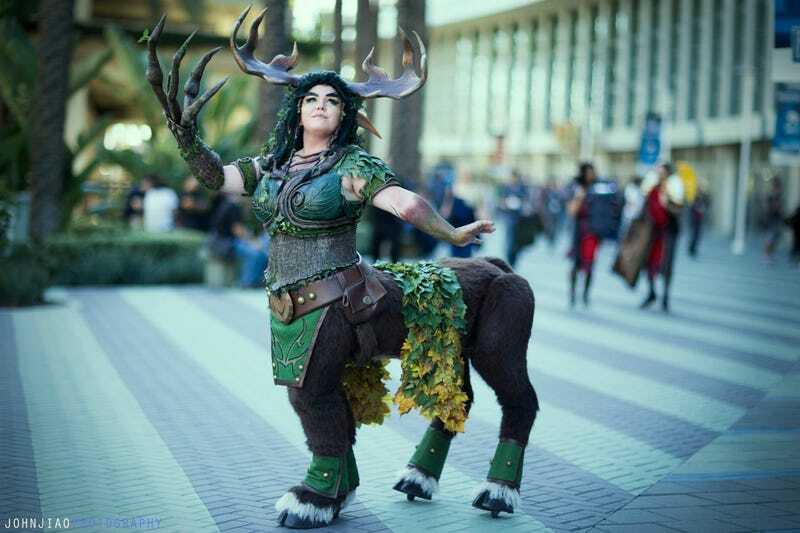 People can - if there is no objective reality, no objective truth, just wake up one morning and dress up like a four-footed mythological beast (whatever is she wearing?) and turn up to a cafe while everyone else is dressed in 'normal' clothes. The 'cosplay' trend in society - something I had never heard of until recently - really does speak of a kind of supposedly harmless alternative sub-culture that amplifies the sense of chaos that is being promoted by liberalism under the guise of personal freedom. The 'I exist', the 'I am', the 'I will be whatever I want to be' movement - which almost certainly pre-empts the 'I will live as I choose to live' culture, I am sure - for many starts out in the realm of fantasy, as personal fantasies are born out before arriving within a 'scene' in which other fantasists can support you. However, we are moving towards a society that is unable to tell people that there really is a difference between a fantasy and the real world. More and more, the Church is surely called to impress upon people the glorious Reality of Jesus Christ. and a relationship with Him because that is not fantasy. That is life-giving, soul-saving. Fantasy - though initially appealing - is really grounded in nothing but illusion. In fact, it really is nothing at all. It is and a kind of artificial perception. As human beings, there is a natural yearning for the authentic, the real, the truly real, even a deep down revulsion that we feel about the seductions of artificial realities. With technological progress it is promised that the encouragement of our Western societies to embrace 'alternative realities' will inevitably lead at least to that attachment to the slavery of passing fancies and transient forms of over-stimulation that made Aldous Huxley's 'Brave New World' so popular - not because it talked of these things as a trend to be desired or followed, but one to be feared above almost anything else. A Church that simply communicates with those living 'new realities' concedes ground straight-away with no original principle guiding it that a definitive reality exists, a supernatural reality of Grace that enables us to move out of the shadowy world of sin and darkness into the true freedom and light of the sons and daughters of God. Much of Lent, I think, is about being stripped of things that amuse us and give us passing pleasure in order to keep us artificially satisfied so that we might know our weakness and our nakedness before the Lord and learn more deeply of our need for Him, our Crucified Saviour. He, Jesus, alone can give us true and lasting peace and satisfy our hearts. The Saints and Martyrs tell us clearly that nothing on Earth but the Cross of Jesus Christ will satisfy us, because only through the Cross will we attain to the Resurrection. Let us fix our gaze solely on Him. It looks like the Pope's new reality will be to wash the feet of refugees on Maundy Thursday. Thank you for this fine commentary on things as they are. It is so comforting to focus on the Cross and our Christ Who died upon It so that we can live in the Truth of His LOVE and peace. As you point out, it is only in this Reality that our hearts and minds are sated eternally. God bless you and all your readers during this holiest of weeks. 'Cosplay' - never heard of it until I read this post although living in Brighton I commented recently to a friend that I often see people in the street who appear to be in fancy dress. Years ago there were lots of young people with colourful mohawk hairdos - now it is ugly tattoos and horrible piercings. Mind you when I arrived here as a student I loved the fact that anything was acceptable in Brighton and that nobody turned a hair however weird and wonderful people looked. Your question of 'whatever is she wearing?' made me add 'where on earth did she buy it?' and 'how did she sit down?' Is there a shop in Brighton which supplies clothes for your alter ego should you wish to become someone or something else for a day? Thank you for this post. Well expressed and very true. Wishing you and those dear to you, a very happy Easter. Pope Francis is a kook. The true Church is reality. The world and its friends are the fantasy (however much popularity the 'reality' of the father-of-lies (Prince of the World) has (and whoever lauds it, from what ever platform). It is the mission of the Church to preach this Truth and give of its gifts/sacraments to those who conform to the Truth. We are all capable of it, despite what Calvin says, and we are all called to it, despite what a heresiarch says. 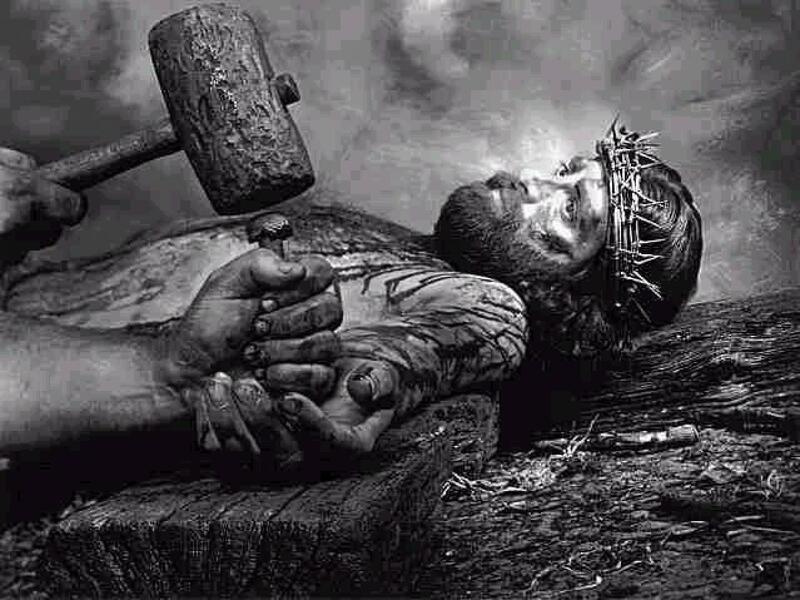 Wow, that picture...very moving, as it reminds one of the utter lack of reason and love in the souls of the persons driving nails through the flesh and bone of another human being. Reality is Christ. If we look to Jesus for our way to behave and to be then we will live true reality. A thought provoking article , Thank you. Good piece. See the consistently superb Sarah tweeting today about the centrality of the cross. Is it too much to hope that he will be our next Pope? Probably, but I suggest that we should all be fervently praying for it. Here is a sermon on the reality of Christ and His Church, in opposition to the prince of this world and his ongoing stream of lies. Oh yes, and there is also death, Judgement, heaven or hell. Knew there were some things not mentioned! That cosplay stuff is fairly prevalent this side of the pond, but it has been going on for years, and usually occurs during comic book and sci-fi conventions. Haven't really seen it during "normal business hours" though, just as part of the aforementioned conventions.